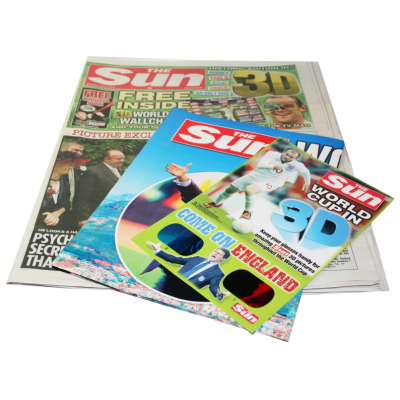 Newspaper Insert (Sun) -American Paper Optics produced 4,600,000 inserts for the London, Irish, and Scottish versions of the Sun.The London Sun provided readers with an anaglyph insert in order to kick off coverage of the 2010 World Cup. Along with a 3D World Cup "wall chart", the Sun also featured converted 3D images on "Page 3", Bizarre and the Street Chic sections. Newspaper Insert (Sun) - American Paper Optics produced 4,600,000 inserts for the London, Irish, and Scottish versions of the Sun. 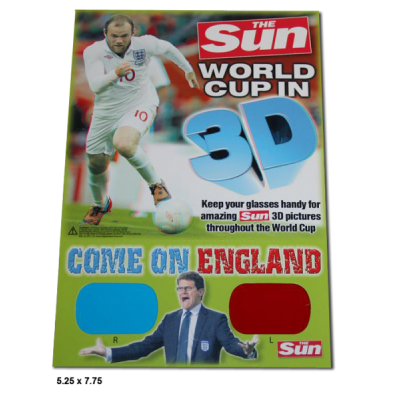 The London Sun provided readers with an anaglyph insert in order to kick off coverage of the 2010 World Cup. Along with a 3D World Cup "wall chart", the Sun also featured converted 3D images on "Page 3", Bizarre and the Street Chic sections.